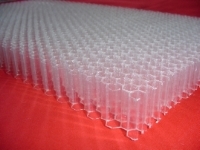 A customized honeycomb can now be made out of any thermoplastic material supplied in the form of a thin sheet reinforced or not with fibres or webs. The sheet can be watertight, porous or even perforated. It is first folded into a semi hexagonal shape and then welded with an array of very homogenous laser lines onto another sheet along the adjacent nodes. The welding speed is very high and the weld is as resistant as the constituting material itself, demonstrating the same properties. A honeycomb block is thus assembled automatically on a compact machine with impressive production rates. The length of the honeycomb block can also be chosen with the accuracy of half a cell width. The honeycomb is mainly used as a core for sandwich panels. Which achieve a construction with unique resistance/weight ratio. A lot of application are to be found in automotive, aerospace, boating, building, energy, furnishing, construction, packaging, trains, etc.